Bonacio's proposal was one of two submitted to the city as part of a request for proposals process this past December. 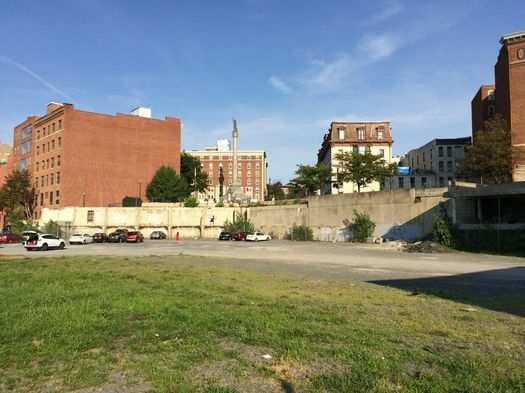 That RFP emphasized the desire for a project that would connect River Street to riverfront, contribute to an "18 hour" downtown, and "create a building that respects the character of Troy's industrial era development and responds to the existing building stock." The other proposal came from Redburn Development of Troy, which had pitched a 90-room hotel at the site. Steven Strichman, Troy's commissioner of planning and economic development, said the Redburn proposal was well received, but the Bonacio plan won out because of its potential to draw a stream of visitors to the site that could benefit nearby restaurants and other downtown business. The proposals were reviewed by a committee of city residents, business owners, and officials selected by the mayor. The process grew out of a public meeting last fall in which the city gathered input from residents about what they'd like to see at site. + Bonacio Construction of Saratoga Springs would buy the 1.6-acre site at 1 Monument Square for $600,000. + Total project cost: about $18 million. The project would also $3.8 million in grants for the site, and the developers will seek a payment in lieu of taxes arrangement through the city industrial development agency. + Bonacio will be a 9-screen movie theater on the site that will be run by Bow Tie. It will be one-floor theater that will be effectively be two stories high. The building will also include 3,000 square feet of retail space. "It will have good retail presence on the first floor," Strichman said. + The building will include 100-150 parking spaces below street level. + The building will be built in such a way that it could be expanded with upper floors to house more commercial space or residential, if market demand points in that direction. The American Theater building, which is about 500 feet down River Street from 1 Monument Square. + The multiplex will be managed by the same Bow Tie team as the 1-screen American Theater down River Street, and Strichman said movies will move back and forth between them. The American Theater space will be able to seat 450 people after it's renovated. + Strichman said the city will not be releasing renderings of the proposed project at this point because they're conceptual and elements are sure to change. Renderings and a site plan will come out during the planning approvals process starting in April. Strichman said the design will fit with the historical aesthetic of downtown Troy. Bonacio has done many projects in Saratoga Springs, including the Railroad Place development that includes a Bow Tie theater. It's also recently started working in Troy with projects such as the Dauchy Building on River Street. So why will it work this time? Strichman said this current proposal builds on the desires and details that emerged during the previous three attempts, and Bonacio is aware of the various complications and quirks of the site. "Everything has come together for this and it's a hugely benefit use," he said. + As its address implies, 1 Monument Square sits right in the middle of downtown Troy, between the square and the river. It is one of the most high-profile real estate sites in all of the Capital Region. 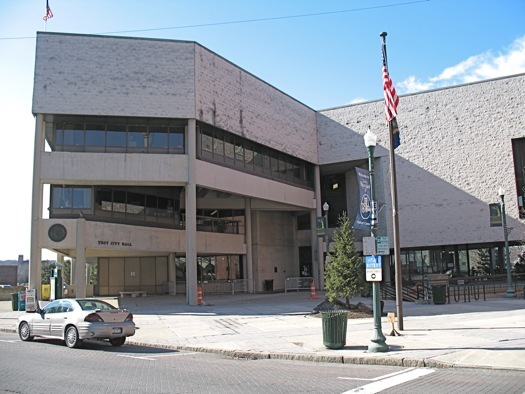 + Troy's former city hall -- a brutalist structure built during the 1970s, that many people did not like -- formerly stood on the site. It was knocked down in 2011. + Since then there have been three major attempts to redevelop the site. All have fizzled, usually with a bit of drama. The most recent attempt made it as far as the city's planning board before facing organized opposition that argued the proposal changed too much since it had been originally proposed and threatened to bring legal action. The developer dropped out in the spring of 2016, saying the city hadn't done a good enough job identifying infrastructure that complicated the site, and pointing a finger at the project's opposition. + That public meeting last August kicked off the fourth major round of attempted redevelopment. got to be more parking for the theater and for all of the surrounding area. No parking , no out of town movie goers. Say goodbye to what you love about Troy. Here's the problem with this proposal. It will be difficult to repurpose this building when eventually the movie theatre goes out of business. You will end up with an building that looks out of sorts, much like the old city hall. It will be tough to convert it to much other than maybe a convention center or performance hall, maybe. A residential project or a mixed residential retail project (preferred) will be just that forever. The other Bow Tie Cinemas do a great business. Not having to drive to get to one will be great, along with not having to deal with jammed parking at any area mall worth seeing a movie at. Instead of immediately declaring that this will be a failure, and since no one who has commented has come up with anything, why don't you step back and actually think about it. Have you been to the other theaters? Have you seen how well they are doing? How the company is doing? It always astounds me how many come out of the woodwork to pounce. And do nothing else. I for one and very hopeful that this plan comes to fruition. We need something to build our tax base on since RPI seems bound and determined to remove as much of it as they can from our tax rolls and constantly increasing out property and school taxes to make up for it. More people will be leaving this area if something isn't done and soon. And what becomes of the Troy Waterfront Farmers Market? And all while the Troy Proctor's Theater sits empty. @allison yes, surely building a movie theater downtown will sap all the creativity right out of troy. what are you even talking about? Astute comment by Troy Observer. One day, in the not too distant future, we will watch first run blockbuster movies on demand in our living rooms (via Amazon, iTunes, Sean Parker's latest strartup). People who think otherwise are probably the same people who think that we should just "give the local taxi companies a chance to clean up their act". This building will soon be empty, but of course the developers will have financed the entire project and placed it in a bankruptcy remote entity (see "Master Developer" on pg. 7 of the proposal). An independent movie theater would make a great fit for Troy, but a 9-screen cinema showing the latest Xmen movies? Do these people actually spend any time in Troy? I shudder to think what this monstrosity will actually look like. I for one would like to see further details of the Redburn Development project, including architectural renderings, proposed Hotel brand partners, etc. I think you're all jumping the gun here. Wait until an actual rendering comes out with site and floor plans before passing judgement. Can folks just be patient for once? We jump and beat down any idea that's floated to make use of vacant lots. "Why can't it be housing? Why can't it be a tiny indie theater? What about parking? What about.....etc." Please, have hope, we can something new and see where it goes. Why is it that the developers in this town are hell bent on regurgitating the same ideas over and over again? Strichman's justification for selecting the Bonacio proposal makes very little sense. People who stay in hotels wouldn't patronize local businesses? 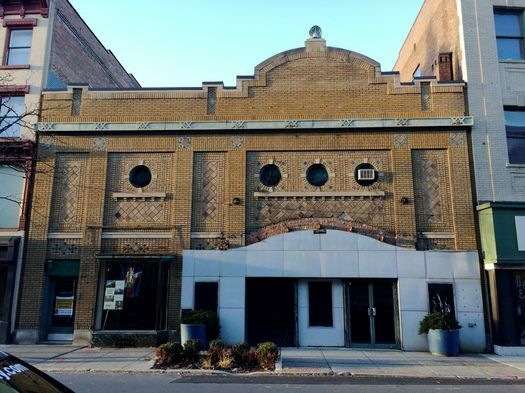 Considering the given assortment of movies and the cost to see them will likely be equal at all other comparable Capital District theaters, what is the potential customer base for this one in Troy? Certainly everyone residing west of the Hudson has a closer option and, on the east side, there will be that starting point of travel where the moviegoer will view the distance to the theater in East Greenbush as being the same to one in Troy. Again, to make my point of this cookie cutter mentality, what would make me go to the Dunkin' Donuts in Troy if that requires me to drive 40 minutes past the one 5 minutes away from my house in Guilderland? I think the movie theater is an excellent idea for the space. Consider Jane Jacob's ideas for American cities - this would add mixed primary uses. River Street has traffic during the day but is empty at night. A movie theater can remedy this and provide economic stimulation to local bars/restaurants/etc. The proposal includes parking spaces and there is already a few other nearby parking garages. Troy seems to be able to handle the significant Farmer's Market traffic with few issues. Finally, Bow Tie runs a good movie theater. From "Movies and Mimosas" to their late night "Insomnia" showings, they clearly know how to innovate. I think it's wise to leave the potential for building residential/commercial expansion open. In the past I've found Bonacio to be good at what they do. I do wish that Troy received more proposals for the site. First comment: "got to be more parking for the theater and for all of the surrounding area. No parking , no out of town movie goers." There is more parking for the theater. Monday through Friday after 5 PM, and all day Saturday and Sunday, there is free parking at the garages at River/Third Street and River/State Street (each less than 5 minutes' walk from One Monument square). I see your point, but the bonus for me would be the better food option and nice environment in Troy, esp in the summer, it's so nice to walk around downtown. Colonie center / wolf road is a nightmare and East Greenbush is boring and full of chain restaurants. I'm not 100% sold on this idea by any means but if it goes through I would definitely be a patron! Proctor's Troy is too large to be used as a movie theater- I mean that a large one-screen theater isn't a good working proposition these days. Now, if it can get revamped as a live performance and films theater (Like the Capitol in Rome NY) that could work. Wish the development would include housing in its initial iteration. Would like to see more condo options downtown and this is a fine site for an agressive mixed use building. Building a multiplex cinema alone in the heart of this historic downtown is underbuilding in this important site. Please PLEASE do not "Mall" Troy! Given the location, it is time to be BOLD and IMAGINATIVE and people and business friendly--adding to Troy's downtown population and employment opportunities with residences, hotel, business offices and labs...---what input have they solicited from RPI for ideas? I respectfully disagree that a movie theater adds nothing to the downtown development. Currently there is very little for residents to do downtown that doesn't involve eating or drinking after 5PM. What we are awash in currently: high priced residential conversions with granite countertops, several eating and drinking establishments, and businesses that close early because there aren't enough people on the streets late at night to make it worthwhile to stay open. Also, there are currently 2 hotels in development for the Troy waterfront and the Hilton across from Dinosaur is almost finished so I would argue that the Redburn development adds even less to Troy's character. In terms of input from RPI, some of the names on the list of people who were part of the committee that reviewed the proposals are involved with RPI and several people that went to the public input meetings/were involved in We Care About the Square were RPI staff. In addition, it's unlikely that an RPI student would be utilizing 1MSQ as a residential conversion however I could see them utilizing the movie theater. A movie theater downtown offers more than just a place for non-Trojans to drive, eat, drink, and leave. Residents of Troy won't have to leave town to catch a movie, it'll be a nice air-conditioned respite during the hottest days of summer for those of us without air conditioning especially now that the public pools are closed, and a walkable theater (two, really...) is a nice selling point for downtown. I really like the proposal... it took my by surprise because I was expecting just another large apartment complex with ground floor retail space. I look forward to seeing the plans. @Cmaxby A minor note, I am not disagreeing with the desirability of a movie house.....so you and I agree on that. (Madison and Spectrum each have multiple screens in 1 bldg and would be good role models for Troy) I am very disappointed that the proposal is for 9 screens and a 150 car parking lot for a "prime" piece of downtown realty....it is not the "Signature" piece for that type of location, and the City won't be getting the full value of taxes for this type of limited development. (heck, the developer won't be paying taxes at the same rate as his neighboring businesses---he's asking for a PILOT instead. Didn't there used to be a movie theater in the Troy Atrium in the early 90's? I don't have a problem with a Bow Tie Cinema in downtown Troy. The problem I have it putting it in a waterfront location. To use this incredibly prime location for a move theater that taken no advantage at all of its waterfront location just blows my mind. I alos question who it will draw. The Schenectady location does well but there seems to be a lack of screens in that area.